“Death Note,” premieres on Friday, April 1, at 7:35 p.m.
Light Yagami, an ordinary university student, finds a notebook dropped by a rogue Shinigami, or death god. After discovering that any human whose name is written in the notebook dies, “the death note” awakens his warped sense of justice and genius. He becomes murderer Kira and punishes criminals. However, as criminals begin dropping dead left and right, the authorities become suspicious and turn to genius private detective L to track down the killer. A deadly game of wits begins. Fully subtitled in English. 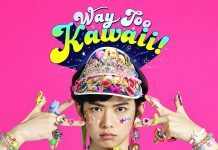 “Mentai Wide Nakayasumi,” premieres on Monday, April 4, at 9 p.m.
“Mentai Wide” is a long-running local-interest program shown on FBS (Fukuoka Broadcasting Corporation) in Fukuoka. “Nakayasumi” is a segment from “Mentai Wide,” which explores recommended spots for a weekend trip in or near Fukuoka Prefecture. Fully subtitled in English. “Kenkaku Shobai SP,” premieres on Thursday, April 14, at 7:35 p.m.
“Kenkaku Shobai” is back with this special episode. Mifuyu stops ruffians from entering her mansion. However, being certain they will come back, Kohei orders his son Daijiro to stay at her home to protect her. There two start having feelings for each other. Fully subtitled in English. “Tabipura,” premieres on Friday, April 22, at 9:05 p.m.
Two good friends go on carefree trips while using only word-of-mouth information, which allows them to make new discoveries, including less-frequented spots that you won’t find in travel guides, recommended spots that only locals know about, and great restaurants that you wouldn’t come across otherwise. Leave the guidebook behind! Fully subtitled in English. “Mystery Hour – Biblia Koshodo no Jiken Techo (Biblia Case Files: Mysteries from an Antiquarian Bookshop),” premieres on Tuesday, April 26, at 7:35 p.m.
Shioriko is the proprietor of Biblia Antiquarian Bookshop. Her sidekick is Daisuke who has trouble reading books because they make him dizzy. Shioriko is shy and introverted, but the abundance of her knowledge in antiquarian books is second to none. She also has amazing powers of logical deduction, and can solve big mysteries from the smallest clues. The unlikely pair join forces to unravel the secrets and mysteries of antiquarian books to help people looking for answers, and the true answers are never what they expect. Fully subtitled in English. Premiere titles air on Friday. “Movie of the Month” premieres on the first Saturday. Movies are shown at various times. Check your digital on-screen guide for movie schedules, using either the GUIDE or INFO buttons (up to one week ahead). Or call NGN, Mon.-Fri. from 9 a.m. to 6 p.m. at 538-1966 for inquiries or to request an e-mail of NGN 3 programming information. All movies are in Japanese language with full English subtitles. April 1: “893 (Yakuza) Gurentai (Yakuza Hooligans),” 1966 action film, 1 hour and 29 minutes. Directed by Sadao Nakajima. Starring Hiroki Matsukata and Ichiro Araki. A bunch of young, angry and penniless misfits are full of great vitality. They aren’t quite up to joining the yakuza and execute a variety of petty scams. After being approached by a yakuza and asked to become a spy for them, they are now planning to take 10 million yen from the yakuza. April 8: “Tabi ni Deta Gokudo (Yakuza on Foot),” 1969 action film, 1 hour and 35 minutes. Directed by Junya Sato. Starring Tomisaburo Wakayama and Shingo Yamashiro. An Osaka gangster Shimamura just got married. His new bride, Mineko is also involved in drug trafficking. When she goes to China to make a deal, things get botched pretty badly. Shimamura must travel to save her and recoup his employers’ losses. April 2: “Judge!” 2014 drama, 1 hour and 45 minutes. Directed by Akira Nagai. Starring Satoshi Tsumabuki and Keiko Kitagawa. A major advertising festival is held in Los Angeles each year to determine the best television commercial in the world. Kiichiro Ota, rookie ad man at a big advertising company is asked by his arrogant boss to take his place as a judge on the festival jury. Meanwhile, a coworker also named Ota poses as his wife so that he can attend an open party, which is held nightly. Knowing that he’ll get fired if his company doesn’t win the Grand Prix, he’s forced to resort to a variety of desperate tactics. “Datsugoku Hiroshima Satsujinshu (The Rapacious Jailbreaker),” 1974 action film, 1 hour and 37 minutes. Directed by Sadao Nakajima. Starring Hiroki Matsukata and Tatsuo Umemiya. Based on a true story about a jailbird who was sentenced for 41 years and escaped seven times. In 1947, Ueda robs a drug dealer and his woman for morphine and kills them. He gets imprisoned in Hiroshima, but escapes next year. From then on he gets caught and imprisoned over and over. “Fune wo Amu (The Great Passage),” 2013 drama, 2 hours and 13 minutes. Directed by Yuya Ishii. Starring Ryuhei Matsuda and Aoi Miyazaki. Mitsuya Majime is an eccentric man in a publishing company who has unique ability of words. He joins the team that will compile a new dictionary, “The Great Passage.” In the eclectic team, he becomes immersed in the world of dictionaries. But the team is overwhelmed with problems contending with an ocean of over 200,000 words by day. Will “The Great Passage” ever be completed? “Gokinzo Yaburi (The Shogun’s Vault),” 1964 samurai film, 1 hour and 34 minutes. Directed by Teruo Ishii. Starring Hashizo Okawa, Chiezo Kataoka and Tetsuro Tanba. Veteran thief Tomizo teams up with Hanji, a former vassal turned criminal, to steal the Shogun’s vault. “Gokuaku Kenpo (The Karate Man and Spy),” 1974 action film, 1 hour and 19 minutes. Starring Tsunehiko Watase and Tamayo Mitsukawa. In 1914, in the beginning of the World War I, a lot of spies are being sent to Japan from Germany and Russia. Sakuragi, a famous Karate master, gets hired by a military commander to eliminate spies. Sakuragi heads to Yokohama China Town to hunt a spy leader. “Hashire Ichiro (Run Ichiro Run),” 2001 drama, 1 hour and 51 minutes. Directed by Kazuki Omori. Starring Masatoshi Nakamura, Yuko Asano and Yoko Minamino. Various individuals named Ichiro undergo life-changing events while being inspired by the baseball player Ichiro. A heartwarming movie about the people who root for the baseball player Ichiro, and their struggles to make their own dreams come true. 2 hours and 58 minutes. Directed by Tomotaka Tasaka. Starring Kinnosuke Nakamura, Michiyo Kogure and Yoshiko Mita. Veteran actor Kinnosuke Nakamura takes on three separate roles in three short stories. realizes his dream of leading an independent life. Osan: Carpenter Santa travels throughout Japan in search of his missing wife. Chan: Poverty stricken craftsman Jukichi must find ways to make money for his family. “Isan Sozoku (Estate Inheritance),” 1990 drama, 1 hour and 50 minutes. Directed by Yasuo Furuhata. Starring Yoshiko Sakuma, Masumi Miyazaki and Misa Shimizu. The unexpected death of Fujishima Motoharu, president of a medium-sized firm, triggers a fierce battle over his estate inheritance among family members. “Jinrui Shikin (The Human Trust),” 2013 drama, 2 hours and 30 minutes. Directed by Junji Sakamoto. Starring Koichi Sato, Shingo Katori and Vincent Gallo. Yuichi Mafune (Koichi Sato) is known as a finance broker, but he’s actually a conman. One day, a wealthy young businessman “M” shows up and hires Yuichi to steal the “M funds.” The “M funds” is thought to be hidden treasure looted from the Bank of Japan and supposedly stashed away by a group of men after World War II in various locations around the globe. He is hired by “M” to steal 10 trillion yen from the M Fund and use it for humanitarian assistance to the Third World. Harold Marcus (Vincent Gallo), an investment banker, sends an assassin to stop them. “Jitsuroku Hishakaku Ookamidomo no Jingi (Code of Wolves),” 1974 action film, 1 hour and 34 minutes. Directed by Shinji Murayama. Starring Bunta Sugawara and Kyosuke Machida. A yakuza survives by relying on his ability and violence. “Jushichinin no Ninja (Seventeen Ninja),” 1963 samurai film, 1 hour and 39 minutes. Chiyonosuke Azuma and Jushiro Konoe. Tadanaga, the son of Shogun Hidetada, has signed a dangerous pact to prevent his brother Iemitsu from becoming the third shogun. In a time where highly skilled ninja organizations carry out secret mission, Iga Jingoza’s group of 17 ninja must find a way to infiltrate the enemy’s stronghold and steal the pact from Negoro ninja Saiga Magakuro. jidaigeki, 1 hour and 55 minutes. Directed by Yasushi Sasaki. Starring Utaemon Ichikawa, Kinnosuke Nakamura, Hashizo Okawa and Hibari Misora. A must see all-star cast movie about two yakuza families living in Edo. Prominent yakuza leader Sukegoro strikes back against Shigezo, an up and coming yakuza leader who threatens to steal Sukegoro’s turf. “Kimitachi ga Ite Boku ga Ita (Here Because of You),” 1964 drama, 1 hour and 27 minutes. Directed by Ryuichi Takamori. Starring Kazuo Funaki, Shinichi Chiba (Sonny Chiba) and Chiyoko Honma. An uplifting drama about the bond between a group of high school seniors and their kind-hearted teacher, Mr. Yabuki. Faced with the rigors of growing up in modern times, students often look to Mr. Yabuki for advice and guidance. But when Mr. Yabuki’s career is threatened as a result of a false accusation from the school’s PTA, the students band together to stand up for their beloved teacher and help him to save his good reputation and job. Directed by Masanobu Deme. Starring Shima Iwashita, Sayuri Yoshinaga, Koji Tamaki and Morio Kazama. A story of friendship between two women, Yae and Kiyoko. Their friendship is tested when artist Yae, who suffers from fatal illness, develops special feelings towards her best friend Kiyoko’s boyfriend Kosuke. “Kujakujo no Hanayome (Bride of Peacock Castle),” 1959 jidaigeki, 1 hour and 29 minutes. Directed by Shoji Matsumura. Starring Ryutaro Otomo and Hibari Misora. A hunter is a given a task of taming a daughter of Shogun in preparation for her marriage to the lord. 1 hour and 51 minutes. Starring Ai Hashimoto and Takahiro Miura. Ichiko lived in a big city. She departs city life to return to her small hometown in the Tohoku region. A self-sufficient woman, she lives alone in her family home in the fictional village of Komori (which literally translates as “Little Forest”). Ichiko gains energy living among nature and eating foods she makes from seasonal ingredients. This gentle drama about going back to basics is filled with imagery of nature, as a young woman returns to her ancestral roots. “Migimagari no Dandy (I’m Dandy),” 1989 drama, 1 hour and 40 minutes. Directed by Hiroyuki Nasu. Starring Koji Tamaki and Koyuki Matsumoto. Ichijo, a middle-aged salary man, hassles to get his career back on track. “Nihon Jokyoden Ketto Midarebana (Bloodiest Flower),” 1971 drama, 1 hour and 47 minutes. The story of Tei, a female coalmine operator, who risks her life to protect the business that was passed on by her late husband. “Oboreru Sakana (Drowning Fish),” 2001 drama, 1 hour and 41 minutes. Directed by Yukihiko Tsutsumi. Starring Kippei Shiina, Yosuke Kubozuka, IZAM, Yukie Nakama, Ken Watanabe, Masato Ibu and Yoko Nogiwa. Two offbeat officers, one who likes to dress as a woman and one who embezzled drug money during a bust, are on the brink of losing their jobs. They are given one final case, involving a gay club that may be covering up a police scandal. If they are successful in their investigation, they will be forgiven. As Akiyoshi and Shirasu begin their work, they discover that the case is much deeper and complicated than the surface reveals, and completing the case becomes the duo’s only priority. “Omatsuri Yaro Uogashi no Kyodaibun (The Festival Champ),” 1976 action film, 1 hour and 34 minutes. Directed by Norihumi Suzuki. Starring Hiroki Matsukata, and Koichi Iwaki. A man working in a fish market is crazy about festivals. “Sengo Hiwa Houseki Ryakudatsu (Postwar Secrets),” 1970 action film, 1 hour and 40 minutes. Directed by Sadao Nakajima. Starring Bunta Sugawara and Chiezo Kataoka. A young man aspires to saving prostitutes from their plight. 1 hour and 32 minutes. Directed by Masahiro Makino. Starring Hashizo Okawa and Satomi Oka. A young samurai disguised as a gambler joins the famous Shimizu family to investigate where Jirocho’s loyalty lies. “Tokyo Beranme Musume (The Tokyo Dame),” 1959 drama, 1 hour and 23 minutes. Directed by Kiyoshi Sasaki. Starring Hibari Misora, Jun Tatara and Miki Sanjo. Misora Hibari stars in this heartwarming story of love and forgiveness about a young woman’s efforts to keep her family together after her sister is disowned by their father for marrying the wrong man. “Tsuri Baka Nisshi 7 (Free and Easy 7),” 1994 comedy/drama, 1 hour and 37 minutes. Directed by Seiji Izumi. Starring Toshiyuki Nishida and Rentaro Mikuni. The seventh installment of the series “Tsuri Baka Nisshi,” which chronicles the adventures of Hama-chan and his boss Su-san, both fishing fanatics. On a fishing trip, Hama-chan and Su-san meet a beautiful lady and the three have a great time. Later, Su-san gets a toothache, and his dentist turns out to be the woman, whom he secretly takes fishing, lying to Hama-chan in the process. When the two men later run into one another, their friendship is threatened. “Umon Torimonocho Manji Gumo (The Eye of the Chinese Festival),” 1962 jidaigeki, 1 hour and 26 minutes. Directed by Toshikazu Kono. Starring Ryutaro Otomo and Kotaro Satomi. Umon investigates the murder of kabuki actors caused by deadly blows of red arrow. “Wakasama Zamurai Torimonocho Kuroi Tsubaki (Case of a Young Lord 9),” 1961 jidaigeki, 1 hour and 34 minutes. Directed by Tadashi Sawashima. Starring Hashizo Okawa and Satomi Oka. Young master comes to rescue Okimi who is suspected of murders in Izu. “Yagyu Bugeicho Dokugan Ittoryu (The Yagyu Military Art: One Eyed Swordsman),” 1964 samurai film, 1 hour and 27 minutes. Directed by Shoji Matsumura. Starring Jushiro Konoe, Hiroki Matsukata, Chiyonosuke Azuma and Isao Yamagata. Yagyu Jubei fights to protect the Yagyu family’s secret scroll from enemy ninjas. “Yojinbo Ichiba (Three Outlaws),” 1963 jidaigeki, 1 hour and 36 minutes. Directed by Teruo Ishii. Starring Hashizo Okawa and Hiroki Matsukata. Young Yanokichi and Niikichi fight against evil Toragoro who extorts money from the local sake breweries.